On Saturday 21 October 2018, thousands of people attended a march for a referendum on Taiwanese independence, the first major protest on the subject since Taiwan established its democracy two decades ago. The protest comes as a response to the People’s Republic of China increasing its economic, military and diplomatic pressure on Taiwan and other states to recognise its claim to the self-ruling island. Thousands of people have rallied in Taiwan's capital to call for a referendum on independence, in the first major protest calling for a popular vote since the self-ruling island became a democracy more than 20 years ago. The march on Saturday through Taipei took place as China has stepped up its claims to Taiwan, which Beijing considers as part of its own territory. "China's aggression can only push us to defend ourselves," a female protester told Al Jazeera. "We will safeguard our right to self-determination." Crowds gathered outside the ruling Democratic Progressive Party (DPP) headquarters in Taipei, chanting slogans such as "Want referendum!" and "Oppose annexation!" China and Taiwan have been ruled separately since the civil war on mainland China in 1949. Taiwan considers itself a sovereign state, with its own currency, judiciary and political system. Beijing, however, sees Taiwan as part of China and has warned it would use force to reunite Taipei with the mainland if necessary. In recent years, Beijing has increased diplomatic, economic and military pressure on the government of Taiwanese President Tsai Ing-wen in an attempt to force her to agree that the island is a part of "one China". It has also successfully pressured global firms to list Taiwan as part of China on their company websites. Fan Yun, a member of the Social Democratic Party, told Al Jazeera that "a referendum is a democratic way to tell China and to tell the whole world that, actually, we want to be an independent country." 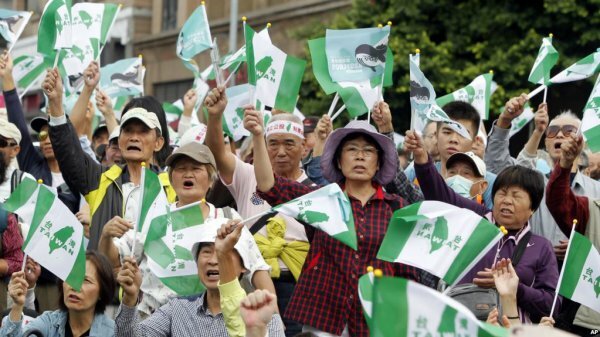 Organised by the Formosa Alliance, which is backed by two former Taiwanese presidents who support independence, the protest amounted to a large-scale demand for a public vote on whether to formally declare Taiwan's independence from China. "We want to tell China to stop bullying Taiwan," Alliance leader Kuo Pei-horng, 63, told the crowd, the AFP news agency reported. "Taiwanese people want to be their own master," he added. Organisers said that more than 100,000 people turned out for the march, although local police put the figure at 10,000, according to news agencies. Protesters also challenged Tsai's stance on a potential independence referendum. Under increased pressure from Beijing, Tsai has sought to strike a balance between appeasing pro-independence groups and Taiwan's powerful neighbour. For its part, the ruling DPP publicly prohibited its officials and candidates from attending Saturday's rally, instead holding its own protest against China's "annexation" of Taiwan in the southern city of Kaohsiung, its traditional heartland. But the rally did not call for an independence vote and in a statement in advance of the protest, the DPP emphasised it did not want to "change the status quo of Taiwan's independent sovereignty". Organisers said 10,000 people attended the Kaohsiung event.